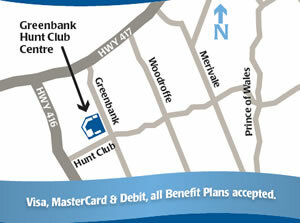 Our store is located at Greenbank Hunt Club Centre, which is on Greenbank Road just north of Hunt Club. As you approach Hunt Club from the 417 the shopping centre is on your right at a set of traffic lights. Once at the Centre, we are just to the right of the Metro grocery store; our sign Comfort Shoes Plus is red and white.